Until 27 September, the IAA will stage major changes: Volkswagen Caminhões & Ônibus (VWCO) enters a new phase to revolutionize the transportation industry. At this press conference, Roberto Cortes, president and CEO of VWCO, will present the news together with Andreas Renschler, CEO of TRATON AG. VW Caminhões e Ônibus presents to visitors to IAA, the world's largest exhibition of commercial vehicles, sustainable technologies developed by Brazilian engineering. Connectivity is also present in the attractions that left the factory in Resende (RJ) for the hall in Hannover, Germany, and conquer the audience that passes through the fair, from many different parts of the world. e-Delivery truck and the Volksbus e-Flex are its prominent highlights. Presented as prototypes, the test phases for both have been defined, as well as the projected date for the start of serial production. The Volkswagen electric model for transporting passengers will begin circulating next year on Brazil's streets. It will enter the company's sales portfolio just six months after the e-Delivery truck, which is scheduled for serial production in 2020. Always staying abreast of the latest developments, Volkswagen Caminhões e Ônibus launches RIO in Latin America to offer customers an advanced set of cloud-based digital solutions way ahead of the connectivity tools currently available in the market. Offering full integration between vehicle, fleet owner, aftersales, driver and end customer, Volkswagen Caminhões e Ônibus and RIO, part of TRATON Group, will provide the technology required by the modern transporter, regardless of its size or route. Brazil will be the first market before RIO plans to expand into Mexico, Argentina and Chile. To meet the regional demands, the platform will offer exclusive services for Latin America, in addition to the global service portfolio from RIO, OEM's and third parties. Ambev, the multinational brewer, and VW Caminhões e Ônibus signed this Thursday, September 20th an agreement to cooperate globally on the development of an electric mobility business model. 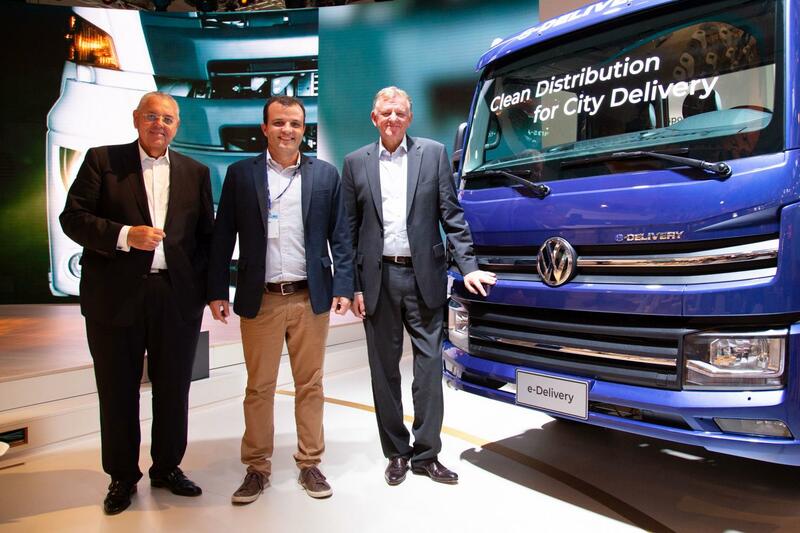 The announcement was made by top executives of VW Caminhões e Ônibus and Guilherme Gaia, Director for Sustainability and Supplies at Ambev, in the presence of Andreas Renschler, CEO of the Traton Group, during the IAA in Hannover, Germany, the largest trade fair for commercial vehicles in the world. The companies aim to join forces to bring electric propulsion to the urban distribution market, establishing a benchmark for sustainability for global logistics by operating the VW e-Delivery truck, charged by sustainable energy sources. This agreement is reached exactly one month after Ambev announced that by 2023 more than 1/3 of its partner distribution fleet will be made up of Volkswagen electric trucks. The initiative involves 1,600 clean-powered vehicles and it is the largest project of its kind in the world announced to date. “By announcing this agreement at an international fair where sustainable mobility is the major theme we are showing that the technology developed by VW Caminhões e Ônibus is firmly committed to this aspect of world development and, more than that, that electric propulsion is feasible", says Roberto Cortes , President and CEO of VW Caminhões e Ônibus. “The dream of establishing the groundwork for electric mobility in support of sustainability is becoming more real every day and with this joint project we reaffirm our commitment to working with partners to develop and market new technologies and processes developed in Brazil that can serve as a benchmark for the global market. Sustainability is not part of our business, it is our business”, says Guilherme Gaia, Director of Sustainability and Supplies at Ambev. The partnership between Ambev and Volkswagen will see 1,600 VW electric trucks being used for the distribution of beverages such as Skol, Brahma, Antarctica and AMA Mineral Water by 2023. This means that more than 1/3 of Ambev’s fleet will be made up of vehicles powered by clean energy, avoiding the emission of more than 30,400 tons of carbon in the company’s logistics chain every year. The first truck to be introduced to the fleet will be VW e-Delivery, arriving on the streets of Brazil by the end of this month and inaugurating the first phase of tests which will determine the best technology to meet the operational needs of Ambev. The vehicles will be recharged using electricity generated from 100% clean sources, such as wind and solar power. This is the first 100% electric light truck in Latin America with zero emissions of CO2, NOX and micro particulates. The solution is in line with the Traton Group's clean technology development and promotion strategy, which both VW Caminhões e Ônibus and Ambev are committed to. The partnership is a milestone in the history of both companies. Working together is an important step towards a future that is less and less dependent on fossil fuels, and meeting the aim to further reduce greenhouse gas emissions in the fleet that serves Ambev, which has already reduced its index by 33.9% by 2014 and 2017. Climate Actions: 100% of the power bought by Ambev must come from renewable sources. Also, the company will reduce by 25% the carbon emissions along its value chain. Recyclable Packaging: 100% of Ambev’s products must be supplied in packaging that is returnable or mainly made of recycled content. Water Management: expressively improve the availability and quality of the water for 100% of the communities in highly water-stressed areas with which the brewery has a relationship. Smart Agriculture: 100% of the brewery’s agricultural partners must be trained, connected and financially structured to develop a more and more sustainable cultivation. Bringing people together to make a better world. This is what Ambev, a Brazilian company headquartered in São Paulo and represented in 18 countries, dreams of. In Brazil, we are over 32 thousand people who share the same passion for making beer and work together to guarantee celebration and fun moments. Ambev is an innovative brewery and we have customers at the very center of our decisions and initiatives. Our portfolio includes beers, soft drinks, teas, isotonic drinks, energy drinks and juices with famous brands like Skol, Brahma, Antarctica, Stella Artois, Wäls, Colorado, Guaraná Antarctica, Fusion, do bem and AMA, the mineral water that reverts 100% of its profits for projects that bring access to drinking water to families of the Brazilian semi-arid region. In the last five years alone, we invested R$ 17.5 billion in the country and left a legacy that goes beyond these investments with our broad sustainability platform. This commitment includes clear goals, which are disclosed to the public, and translate into four pillars: smart consumption, water, zero residue and development. This work is made with a partner network, because we believe that building a new world becomes richer when we do it together. As a manufacturer of Volkswagen and MAN commercial vehicles, VW Caminhões e Ônibus is one of the largest manufacturers of trucks and buses in Latin America. The innovative company will now produce VW e-Delivery vehicles together with its partners in the Modular Consortium, at the plant located in Resende (RJ). “Innovation is in our DNA. Combining our known concepts ‘Less you don't want; More you don't need' and 'Tailor-made', RIO's launch will add digital solutions for the complete ecosystems of transport and logistics. This will represent a revolution over the pioneer technology Volksnet, incorporating its features and offering a lot more. Transport in Latin America will be much safer and more efficient”, says Roberto Cortes, CEO of Volkswagen Caminhões e Ônibus. Brazil will be the first market before RIO plans to expand into Mexico, Argentina and Chile. To meet the regional demands, the platform will offer exclusive services for Latin America, in addition to the global service portfolio from RIO, OEM’s and third parties. One of these examples is the Security package. 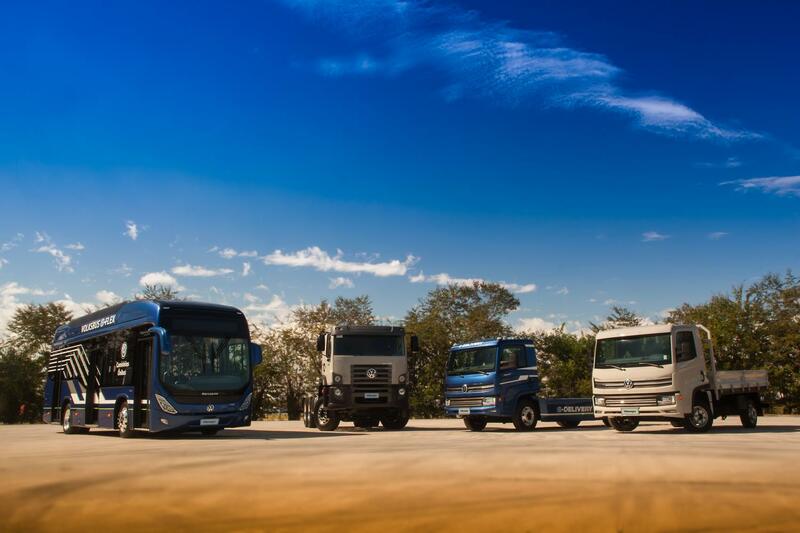 “Throughout the next year, Delivery, Constellation and MAN trucks, in addition to the Volksbus, aimed at the Brazilian market, will gradually start leaving the factory ready for digital connection through it’s line fitted RIO Box. The RIO Box will also be offered as a retrofit solution to those who already have VW vehicles with an open FMS interface. We hope to reach the other Latin markets shortly, starting by transport operations in our frontiers”, explains Cortes. The interface will also create benefits to other services VWCO offers its clients. In Volkswagen’s trucks and buses connected to the RIO Box, customer service via ChameVolks will be much more efficient and agile. When getting a call, the consultant will promptly identify the location and history of the indicators, which will help in delivering a correct diagnosis for the vehicle. Thus, the dealer contacted will be more prepared to provide service effectively, whether on the field or in his space, increasing productivity by enabling less vehicle downtime for maintenance. The vehicles equipped with the RIO Box come with a free of charge basic package called RIO Essentials and will have access to further exclusive solutions offered on the Marketplace (virtual market). RIO Essentials equips the customer with digital maps that display the position of the vehicle, performance analysis, average fuel consumption, distance covered in the period, driving and stop times, besides engine hours. RIO Services will be progressively introduced onto the platform’s Marketplace. “Customers can add or cancel services individually on a daily and vehicle basis without a minimum runtime – membership fees or minimum stipulated term of permanence don’t apply, except for services requiring additional equipment (like sirens, sensors, etc. )”, explains Jan Kaumanns, CEO of RIO. In addition to Essentials, RIO’s services to be made available to Volkswagen Caminhões e Ônibus’ customers will be: vehicle’s performance assessment with larger data cloud storage; driver’s training and monitoring; tachograph management; and maintenance planning. Other services aimed at advanced logistics will be offered through the platform, like: localization, fences and alerts; delivery management and message exchange with the driver; identify and manage implements. The exclusive RIO service for LatAm markets, the Security, aim for better safety management of the cargo and the vehicle itself on three different levels, especially designed to fulfil the ‘risk management plan’ established by the Risk Agencies. The RIO logistics ecosystem is cloud-based, open and provides the customer with access to all applications and services on a single interface. With RIO, renowned companies will offer their services on the Marketplace, like: Omnilink, Continental, Pirelli Cyberfleet, PST Positron, Bosch and DriveUp. With a construction that is friendly and open to new logistic services, RIO is a platform to offer services of start-ups and innovative companies in the segment. The information package can be shared with the vehicle’s owner, the driver and, in a near-future, even with the authorized dealership network (to schedule maintenance services, for instance). Brazilian customers are already driving around equipped with RIO Box (equipment that connects the vehicle to “cloud” solutions) to test the novelty. Vehicle data can be visualized in real-time at RIO’s booth (hall 12, booth C21) at the IAA Auto Show in Hannover, Germany, from September 20 to 27. Also in the auto show, all vehicles exhibited by Volkswagen Caminhões e Ônibus will feature RIO Box. In the electric models, TRATON’s pillars represented by the words “Clean” and “Connected” are seen together for the first time in products with state-of-art technology aimed at emerging markets. RIO’s solutions reach Latin America only two years after the novelty was presented in Europe, exactly one edition ago at IAA 2016 in Hannover. RIO is an open cloud-based logistics ecosystem which will take Latin America’s global transport and logistics ecosystem massive steps ahead. It combines information on trucks, trailers, drivers and orders with data on traffic, weather and navigation, creating valuable and custom-made recommendations in real time. The novelty: integrating all stakeholders of the supply chain into a connectivity environment. Offering all benefits of digitalization for large and small companies in the logistics segment. And the best: RIO is developed by the TRATON Group and built based on long-term partnerships with great experience in the segment. Volkswagen Caminhões e Ônibus is at IAA, the world’s largest commercial vehicles show, with innovative technology that will leave its mark on the future of mobility, where the e-Delivery truck and the Volksbus e-Flex are its prominent highlights. Presented as prototypes, the test phases for both have been defined, as well as the projected date for the start of serial production. The Volkswagen electric model for transporting passengers will begin circulating next year on Brazil’s streets. It will enter the company’s sales portfolio just six months after the e-Delivery truck, which is scheduled for serial production in 2020. “In a new world premiere, Volkswagen Caminhões e Ônibus presents an electric solution for passenger transportation. 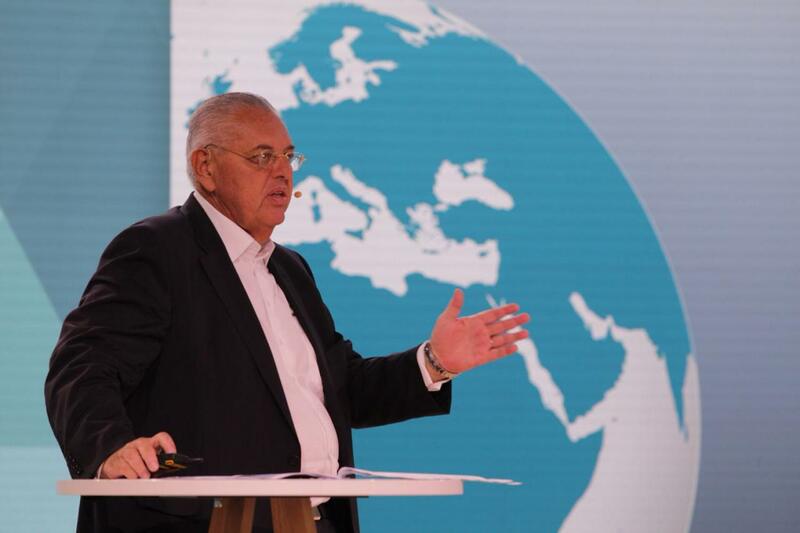 We have brought our contribution to the world debate about new energy sources, with viable and concrete solutions, supported by tests with international standards”, declares Roberto Cortes, president and CEO of Volkswagen Caminhões e Ônibus. At the same time, the company has taken firm steps toward connectivity, another pillar for transportation’s next level. RIO tool is already in tests with Brazilian clients to demonstrate how digital solutions can contribute to increase the business of both large fleets as well as small carriers. At the Volkswagen Caminhões e Ônibus booth, the best in diesel technology can also be found: the Constellation 33.440 and the Delivery Express are, respectively, VWCO’s heaviest and lightest models to assure solutions designed specifically for the current needs of the emerging markets. “We have begun our largest cycle of investments, totaling R$1.5 billion, in order to focus on new products, new markets, digitalization and connectivity for our brand”, reveals Roberto Cortes. The e-Delivery hits the IAA presenting two novelties: the powertrain and battery set developed by the TRATON Group, of which Volkswagen Caminhões e Ônibus is part as one of the strong brands, and the new modular configuration for electric commercial vehicles conceived by the Brazilian Engineering department, intended to cover most Volkswagen’s platforms. The model is undergoing tests and its serial production is expected by 2020. The new powertrain developed by the TRATON Group confers the e-Delivery all the synergy of components and its subsequent gains. The electric engine and inverter set is present in the group’s entire electrical line, as well as the battery banks, which share lithium-ion nickel-manganese-cobalt (NMC) cells. With the new powertrain, the e-Delivery offers up to 260 kW of power, with maximum torque of 2,150Nm, even at low rotations, and does not require the use of transmission in the applications of the Delivery family due to its high torque sent to the drive axle. The modular configuration, with the reallocation of the electric motor to the rear overhang, allows to divide the vehicle into three main modules: front module (cabin and auxiliary features), center module (batteries) and rear module (powertrain). It is a new concept for electric trucks, whose aim is to make assembly flexible and clear more space for batteries. This allows creating different arrangements and combining modules to use this vehicle as the base for new electric models. Modular packages are fully independent, which makes using different components and concepts easy and simple, and allows the highest synergies between the group’s companies and partners. With a new setting of NMC batteries, the maximum autonomy of the new e-Delivery family exceeds 200 km, which may vary depending on how the vehicle is set to serve customers’ applications. Similar to the Volksbus e-Flex, battery recharge can be made in the quick mode, recovering 30% in 15 minutes or 100% in three hours, depending on the desired configuration. The model presented at IAA also makes advancements with its smart systems. Now it features pneumatic suspensions and brings a smart payload reading system in order to adjust power consumption with the Eco-Drive Mode. To maximize the e-Delivery’s performance, the brake has three regeneration stages to recover up to 30% of the power during braking, using the same energy to recharge the battery. The regenerative brake acts before the pneumatic brake to slow down the vehicle, and the entire system can be adjusted according to the cargo condition or driver’s preference. Its powertrain is ready to start in hills of 30% slope, without any difficulties, with the support of the hill start assist (HSA) system. The auxiliary systems, such as air compressors, air conditioning, steering and water pump are controlled independently, thus optimizing their power consumption. Axles, chassis, wheels and tires maintain the traditional features and all the robustness of the new Delivery line, sharing platform components with the diesel family to ensure synergy and scaling, aiming at the subsequent reduction of costs. With this evolution in settings, Volkswagen Caminhões e Ônibus presents an e-Delivery which offers not only robustness, but high performance to the market. “With dimensions fitted for operations in large urban centers and comfort, connectivity, safety, low operational cost and energy-efficiency features, our e-Delivery helps making the concept of efficient and smart cities viable, with rational and productive cargo transport, encouraging suppliers to support of electric mobility, especially in developing countries”, stresses Cortes. The Volksbus e-Flex is one of Volkswagen Caminhões e Ônibus’ important news at the IAA, bringing an exclusive solution of flexible architecture for electrification, with a concept that can be applied in virtually any vehicle of the brand. The automaker developed the widest, most innovative concept of flexibility and modularity to be applied in commercial vehicles: in a single model, it is possible to find all variants of electric mobility. The VWCO model can work with battery electric vehicles (BEV); hybrid electric vehicles (HEV); plug-in hybrid electric vehicles (PHEV); and range-extended electric vehicles (REEV). Performance is maintained regardless of how the batteries are fed. Developed by the TRATON Group itself, the batteries can be fed by external chargers in the plug-in concept, or also by a generator present in the vehicle, responsible for one of the greatest news in this solution, and for allowing increasing its autonomy. In an initiative of partnership development and reinforcing the potential for cooperation between the brands of the Volkswagen Group, a generator set, propelled by one of the most efficient engines in Brazil (the VW 1.4 TSI Flex, currently used for the Golf) was an exclusive and pioneering creation of the Engineering departments of Volkswagen Caminhões e Ônibus (Resende) and Volkswagen do Brasil (São Bernardo do Campo). This engine can be fueled with gasoline or ethanol, and also allows a version for natural gas or biomethane (1.4 TGI). Thus, offering a highly power-efficient, low-emission level and competitive-cost set. The start of the generator and engine set is smart and made automatically by the vehicle’s electronic system, as soon as the previously programmed battery charge level is detected. With the e-Flex technology, the need of recharge infrastructure is reduced, which can speed up and make easier the introduction of this electric vehicle in cities that are still beginning to implement this kind of mobility. This setting even allows eliminating recharge stations or, at least, their balanced use, without constraining operation in some applications. The Volksbus e-Flex, which features this autonomy-extending set, makes the amount of batteries required for each application more flexible, and can operate with a minimum amount, when compared to traditional electric vehicles, maintaining or even exceeding their range in kilometers, depending on the application. The battery banks in this model are lithium-ion nickel-manganese-cobalt (NMC) to deliver high power density and share its cells with the passenger vehicles of the entire Volkswagen Group. This strategy enables obtaining maximum scale-production synergy, meaning it collaborates to reduce battery costs, which currently correspond to a significant amount of the vehicle's acquisition price. The vehicle can run in full electric mode, depending on the application's demand. This flexibility ensures free riding also in green zones, where there are restrictions for vehicles that are not qualified as “zero-emission”. “This electrification model is very interesting, once its flexibility satisfies the zero-emission needs with a lower investment cost to rise to the challenges faced by the electric industry in the path towards its commercial implementation, in addition to extending its autonomy for any unexpected events that may happen in the way, without ceasing to comply with the rules in the zones where circulation is restricted”, states Roberto Cortes. The Volksbus e-Flex architectural flexibility allows introducing the vehicle in different markets. For example, it is possible to adjust its configuration to the power matrix of each country. In Brazil, by using ethanol in the engine generator set, the continuous expansion of this nearly CO2 neutral biofuel is supported (in the well to wheel cycle), in addition to reducing by more than 90% the emissions of NOx and local particulate materials. All that without necessarily depending on local recharge infrastructure, allowing a gradual introduction of clean technologies into large cities. In other Latin-American countries, many of which have their power matrix based on natural gas, the Volksbus e-Flex allows operating with the 1.4 TGI version of the engine to, in the same way as the TSI, reduce CO2 emissions and take advantage of its natural resources, improving operational costs. The vehicle also features a power regeneration system that can provide up to 30% recovery of what is required for the vehicles total movement. The electric engine is capable of delivering up to 260 kW of power, with maximum torque of 2,150 Nm, even at low rotations. The pneumatic suspension featured in this Volksbus also makes a real-time reading of the vehicle’s weight during operation and, combined with Eco-Drive Mode system, adjusts the vehicle’s power consumption. In addition to eco-friendly, this chassis follows the modern accessibility standards, complying with current mobility requirements: access ramp, kneeling system and low floor. In another one of the group’s synergy projects, the Constellation 33.440 combines successful VW and MAN features in a single prototype: the renowned Constellation cabin and the robustness of MAN's chassis and engine. The project combines the expertise of Brazilian and German engineering with the aim of achieving the best configuration for a typically Brazilian application. The solution is about to enter factory tests to serve the sugarcane (taking sugarcane from field to the mill) and forest (transporting reforested wood) segments. The MAN D26 engine generates 440 hp and the most extensive plain torque curve in the category, supplying 2,200 Nm from 950 to 1,400 rpm. It features ZF 16-speed automated transmission. The 515-liter fuel tank capacity is appropriate for operation. Another customized feature is the option of rear axles with hub reduction, which extends its traction capability and makes this prototype more robust and ideal for high-performance applications in heavy transport. The combination of the D26 engine, the 16-speed transmission and the hub reduction axle promotes maximum operational efficiency with performance, as well as optimized fuel consumption optimized for the application. There are drum brakes in the front and rear wheels, extending durability in dust and dirty tracks, with the safety of the ABS systems (which keeps the wheel from being blocked and sliding off when the brake pedal is abruptly stepped on), EBD (works in combination with the ABS system and its function is to distribute the braking force throughout the vehicle’s wheels), ATC (which keeps the wheels from sliding) and EasyStart, to aid starting in gradient. The maximum traction capability (MTC) with hub reduction axles is around 125 tons and, combined with robustness, performance and operational cost, confers high availability and productivity to the operation. The operator can also manage the application’s on-road and off-road modes by simply pushing a button, in which the strategy of speed-shifting in the automated transmission is unique, exactly to efficiently comply to the conditions in which the vehicle may need to ride through roads. The result is a custom-made heavy duty vehicle for off-road tracks, with high cargo capacity, chassis robustness and comfort in operation. Outcome of a R$ 1 billion investment in the new Delivery line, a new champion makes its world debut at IAA. The Delivery Express arrives with the concept of a ready to load vehicle to offer more simplicity to Volkswagen Caminhões e Ônibus’ customers: the vehicle is delivered with an implement, thus ready to load and ready to roll. The vehicle that anyone can drive combines the comfort of a car and the typical robustness of a real truck. For its 3.5-ton TGW, it fits into the Brazilian segment of pick-up trucks. With the largest internal roominess in the segment in the markets where it is already available, the cabin of the new Delivery combines the most innovative features of ergonomics, comfort, internal roominess and robustness. To offer this result, its development started from the inside out. Driving position, steering wheel grip and seat height adjustment were the initial priorities. Even before speeding up, it provides a whole new experience: the seats were conceived with the collaboration of tens of people with different statures and physiques, so driving could be comfortable for everyone. Safety is another highlight: the advanced cabin also offers more visibility when exiting ramps or curves, offering more agility in the driver's decision-making. The maneuverability also stands out as the best of the market for this segment, thanks to the wider steering angle and the gain in maneuvering in narrow roads. In the panel, the economic driving mode allows the driver to follow the indications of the ideal moments to shift gear, which preserves components against wear and also optimizes the reduction of fuel consumption. With Euro 5 technology and EGR system, which does not require the use of AdBlue, the Delivery Express is also the supreme reference to the unique features offered by the line: best power and torque when compared to its main competition. The new generation of the Delivery line has been designed and developed to define a new benchmark in customer satisfaction needs combined with timeless Volkswagen Values: custom-made solutions, perfect functionality and visual quality. Thus, the design team created a new logic design language focusing on functionality and unique aesthetics. The Delivery Express opens a new niche for Volkswagen Caminhões e Ônibus in the market — the challenging 3.5-ton segment— and arrives, with the entire new Delivery family, to revolutionize cargo transport in the segment of light-duty trucks. Until September 27, the IAA will be the stage for big changes: Volkswagen Caminhões e Ônibus enters its new era in terms of developing clean technologies and connectivity to support the evolution of the transport industry. In this new phase, the automaker revolutionizes with exclusive electric vehicle concepts in synergy with the other brands of the TRATON Group. Also, the company makes advancements in the connectivity field: the tool RIO hits Latin America in 2019 to offer digital solutions for Volkswagen Caminhões e Ônibus’ customers. In its ninth participation in the show, this is the first time that the automaker will share its space with other TRATON Group brands in an exclusive hall. One of the new exponents of this company’s movement is the e-Delivery, which brings a new modular concept in vehicle building, allowing to configure different load and autonomy capabilities, and is already winning over the market. Also for the first time, it brings electric traction components developed by the TRATON Group for its powertrain. In the same line of diversifying to meet customers’ needs, the Volksbus e-Flex unravels an innovative flexible architecture system for electrification. The secret of this exclusive solution is allying technologies that combine several recharge and fuel possibilities with a concept that goes beyond hybridization. Another attraction that proves the synergy between the group’s brands is the Constellation 33.400, which combines the robustness of MAN’s chassis and engine and the renowned cabin of the VW Constellation family. Volkswagen’s most powerful model will stand in the show side-by-side with the Delivery Express, the lightest in VW’s family and an outcome of a R$ 1 billion investment cycle, that also showcases the ready to load concept of selling complete vehicles. “This is a historical moment for us. At the same time that we return to our core as Volkswagen Caminhões e Ônibus, we keep moving forward by maintaining the sales and production of MAN vehicles, in addition to Volkswagen products, in Latin America, and pave the path towards the future with the technologies that will win over the market. With this, we provide vital support for the TRATON Group in its mission to become a global champion by bringing innovation, global footprint and profitability”, states Roberto Cortes, CEO of Volkswagen Caminhões e Ônibus.